13 1/2 x 22 1/2 x 11 in. 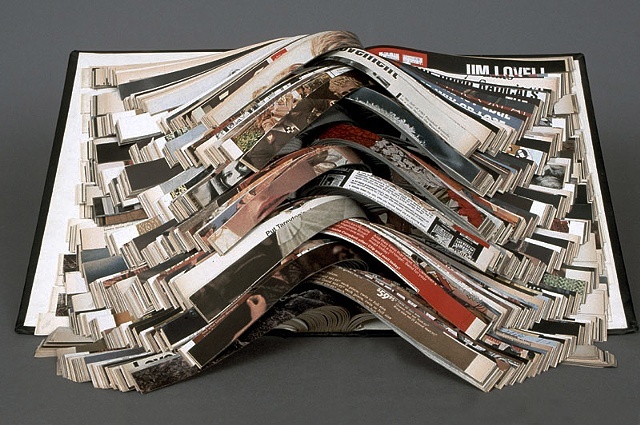 As befits the title it takes from the magazine, this bookwork appears to have been dissected, its pages splayed out, cut towards the spine in one-inch sections. The alternating rows flip one way, then the other, interweaving stories in that familiar bold typeface with those famously evocative photographs. Its guts exposed, the text is suddenly incongruous, skipping randomly from one set of ideas to anotheryet in some sense no more arbitrary and partial than the magazines own pretensions to delivering up the essence of contemporary existence in a relatively small sum of words and pictures.